Discontent is bubbling away in Macedonia, where opposition politicians have disclosed secret audio recordings that suggest the country's intelligence services illegally wiretapped government employees, politicians, journalists, editors, and foreign diplomatic representatives. Zoran Zaev, the leader of the Social-Democrat Party, brought the tapes to the public’s attention in early February 2015. He alleges that the spying was done on the order of conservative Prime Minister Nikola Gruevski and members of his family. The leaked tapes allegedly span a four-year period and seem to confirm, among other things, suspicions of election fraud during the 2014 vote (in which Prime Minister Gruevski's VMRO-DPMNE party claimed victory) and of an official cover-up in the 2011 murder of Martin Neshkovski at the hands of a police officer. 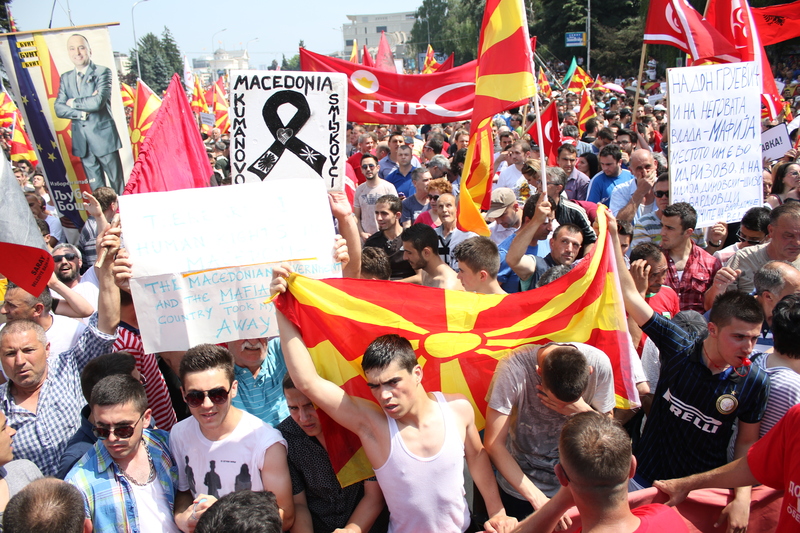 Spurred by the revelations of alleged injustice in the Neshkovski case, Macedonians around the country took to the streets beginning in early May. On May 5, what began as peaceful protests in Macedonia's capital Skopje turned violent as police began dispersing the crowds with water cannons, smoke bombs and batons. Demonstrations have become a normal sight in large cities of the country, one of the poorest in Europe. Macedonia, which was once part of Yugoslavia, grapples with social inequality, and the government has certainly been accused of ineptitude and corruption before. But such violence was a disturbing new development. During a second day of protests, a group of women formed a human shield around police in an effort to keep the peace in light of “football fans” wearing hoods and masks who were throwing objects at the parliament and the police cordon. On the first day of protests, one particular participant caught the world's attention after a Reuters photographer captured her reapplying her red lipstick using one of the riot police officer's shields to view her reflection. Freedom of the press has long been under pressure in Macedonia. The Interior Ministry's top intelligence official Sasho Mijalkov, who is accused of heading the illegal wiretapping, was instrumental in implementing financial pressure on a critical Macedonian weekly magazine in a defamation lawsuit in 2014, which ultimately led to the magazine’s shutter and large fines for its editor and journalists. In April 2015, Borjan Jovanovski, a prominent Macedonian news anchor, received a funeral wreath at his home with the message “Final Farewell.” Jovanovski works for the independent news website Nova TV and is a well-known critic of Prime Minister Gruevski's government. One week before the tapes were revealed, Prime Minister Gruevski charged Zaev and others with conspiring with a foreign intelligence service to topple the government. Since protests began, Interior Minister Gordana Jankuloska, Transport Minister Mile Janakieski and intelligence chief Mijalkov have all resigned. Following a deadly gun battle between an armed ethnic Albanian and police in May, in which 22 people were killed, European Union officials mediated talks between Gruevski and Zaev to resolve the political crisis in the EU candidate country. But negotiations have so far failed to achieve a resolution. Macedonia's constitution explicitly protects the right to privacy, but under recent reforms, authorities have required telecommunications operators to build “back doors” into their technologies so that the Security and Counterintelligence Service, known as UBK, can listen to the conversations of just about anyone it chooses. A tongue-in-cheek explanation of the situation in Macedonia as compared to the US, written by a BuzzFeed community member: Imagine this happening on Obama’s Reelection!